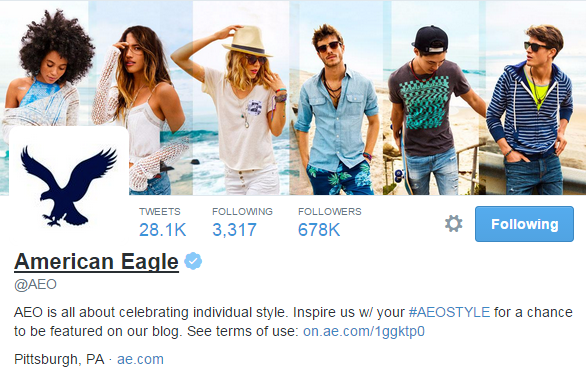 There are only so many ways brands can customize their Twitter profiles to make a good impression on visitors and entice them to hit the “follow” button. 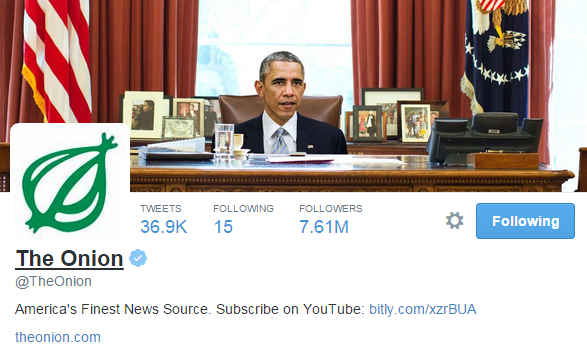 One of the most important profile elements to customize is the bio section. In fact, Twitter users oftentimes look at the bio section specifically for help making the decision whether or not to follow a brand's handle. Moreover, the bio section can serve as a place to highlight marketing or customers service initiatives. 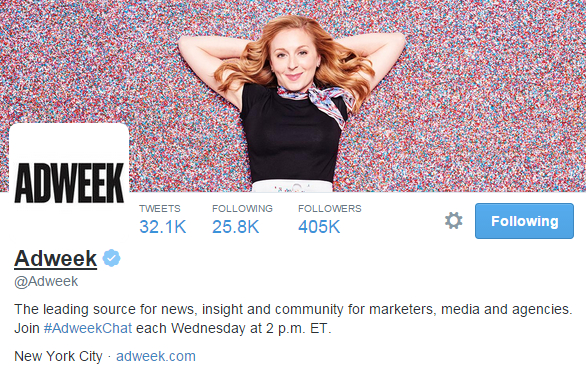 Why it’s Terrific: Adweek lets visitors know exactly what type of brand it is by featuring a short and to-the-point description in its bio. In addition, the company leverages its bio space to promote its weekly chat initiative and associated hashtag (#AdweekChat). 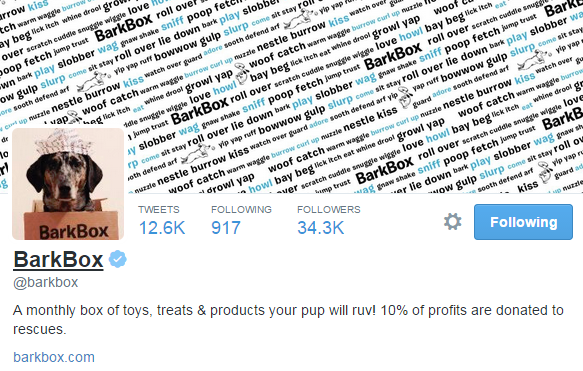 Why it’s Terrific: Barkbox not only uses its bio to accurately describe its business, but also to let visitors know that it gives back to the animal community by giving 10 percent of profits to rescues. 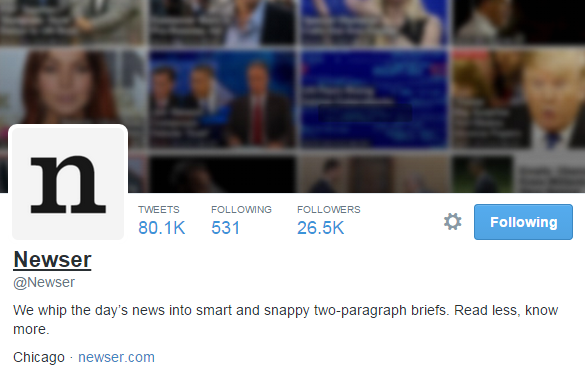 Why it’s Terrific: Newser’s Twitter bio is terrific simply because it gets straight to the point by letting visitors know exactly what type of content they can expect by following the brand. 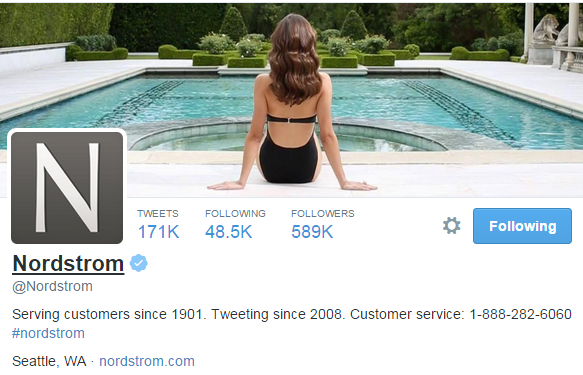 Why it’s Terrific: Nordstrom makes it simple for anyone to get in touch with a service representative by including its customer service number directly within its bio. 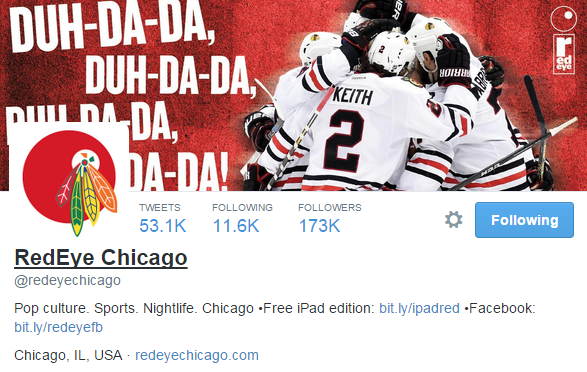 Why it’s Terrific: RedEye does a good job at describing its brand and the content it covers with its brief bio section. What really stands out, however, is that the company promotes its iPad publication with a short link as well as its Facebook presence. 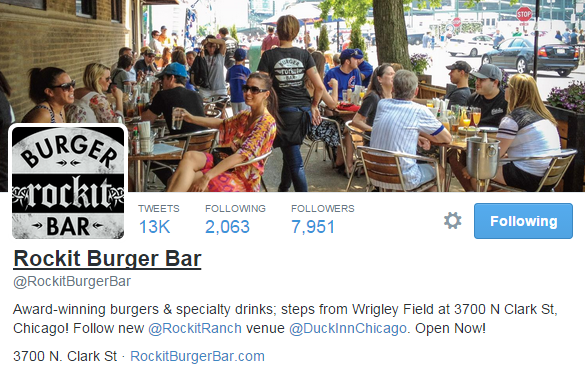 Why it’s Terrific: Rocket Burger Bar leverages its bio section to reach out to local customers. The company features an informative description as well as its address and links to the handles of local sister restaurants. 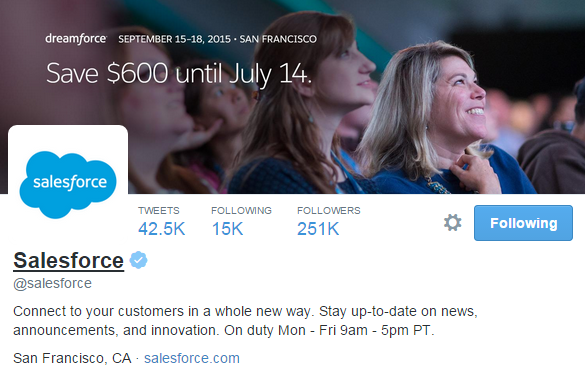 Why it’s Terrific: Salesforce uses its bio section to highlight what type of content the company tweets. What really stands out, however, is that the company features the days and hours when it has employees active to answer questions or comments on the social network. Why it’s Terrific: The Onion leverages the bio section to promote one of its other social media presences – its YouTube channel – with a short link. 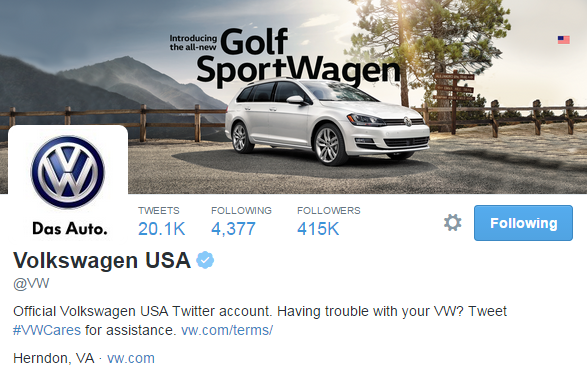 Why it’s Terrific: Volkswagen uses its bio to clearly state that this is the official account for the company’s USA customers. In addition, Volkswagen encourages anyone who needs assistance with their VW vehicle to use the hashtag #VWCares in their tweets for assistance. Lastly, Volkswagen includes a short link to its terms of service in its bio.